Newcomer airline go! is starting a midsummer air-fare price competition by offering $29 one-way trips between Honolulu and the neighbor islands, it announced yesterday. Tickets must be purchased by Tuesday for travel completed between today and Sept. 30. The fares are $10 lower than the current one-way price between Honolulu and the neighbor islands. The fares will be good for travel between Honolulu and Hilo, Kailua-Kona, Lihue, or Kahului. Flights between neighbor island destinations will be $58 one way, said go! spokesman Joe Bock. Aloha and Hawaiian airlines said yesterday that they will match go! 's fares. "Aloha offered several thousand seats at that fare last week," Aloha spokesman Stu Glauberman said. "We will continue to be competitive." Hawaiian spokesman Keoni Wagner said the matching fares will be available tomorrow on the airline's Web site. Full-page ads trumpeted the new, low interisland price in today's newspaper. Go! 's parent, Mesa Air Group Inc., started flying among Hawaii's main islands June 9. It kicked off its ticket sales with $39 one-way fares in March, then dropped fares to $19 for a short period of time. Hawaiian Airlines matched the $19 fare, and Aloha gave away 1,000 free round-trip tickets. "The mission of go! is to bring friends, families, and business people together by offering exceptional service at the lowest possible price," Mesa Air Group Chairman and Chief Executive Jonathan Ornstein said in a written statement released yesterday with the fare announcement. The current go! promotion comes just a few days after Ornstein said the company was losing about $300 per flight at its $39 fare. He also said Mesa hopes to bring larger regional jets next year, which would enable it to make money under the $39 price structure. Go! has been flying its five 50-seat Bombardier CRJ 200 planes at 80 to 85 percent full, Bock said. Hawaiian Airlines has 11 Boeing 717s that hold 123 passengers each. Aloha Airlines has 10 Boeing 737-200s that seat 127 passengers, plus three more 737s used as cargo planes. 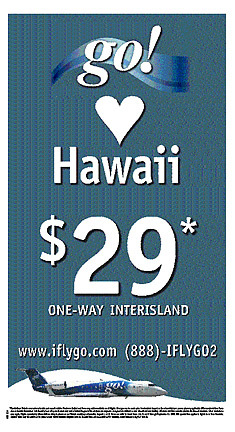 » Mesa Air Group Inc.'s $29 one-way, $58 round-trip interisland fares on go! must be bought before midnight Tuesday, for travel today through Sept. 30. » Tickets are nonrefundable, and changes can be made for a fee of $20 plus any applicable difference in air fare. » Tickets are nontransferable and nonrefundable. Seats are limited, and fares might not be available on all flights. Prices do not include a $5 security fee each way or a federal segment tax of $3.30 per segment. » Tickets can be booked at www.iflygo.com or 888-IFLYGO2. » Hawaiian Airlines and Aloha Airlines said they would match the fares.